The SSR System is a low-slope, clip mounted standing seam roof that meets the most demanding performance specifications. These durable, low-maintenance panels are interlocked and mechanically field-seamed into place, yielding a single membrane, allowing for quick construction at a lower cost. The slotted clip allows up to 3 1/4" of thermal movement. 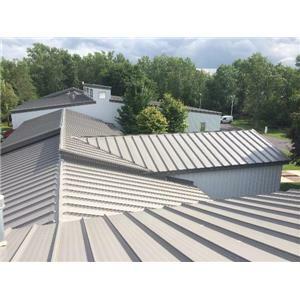 VP&apos;s standing seam roof patented ridge system seams together and provides a true expansion joint. Panels are available in standard 24 gauge, with 22 gauge option, and finish options of unpainted Galvalume or 14 KXL Cool Colors. Roof slopes as low as 1/4" in 12"